If you’re running a nonprofit or charity group, you shouldn’t be spending money on things like web design or a good website, right? 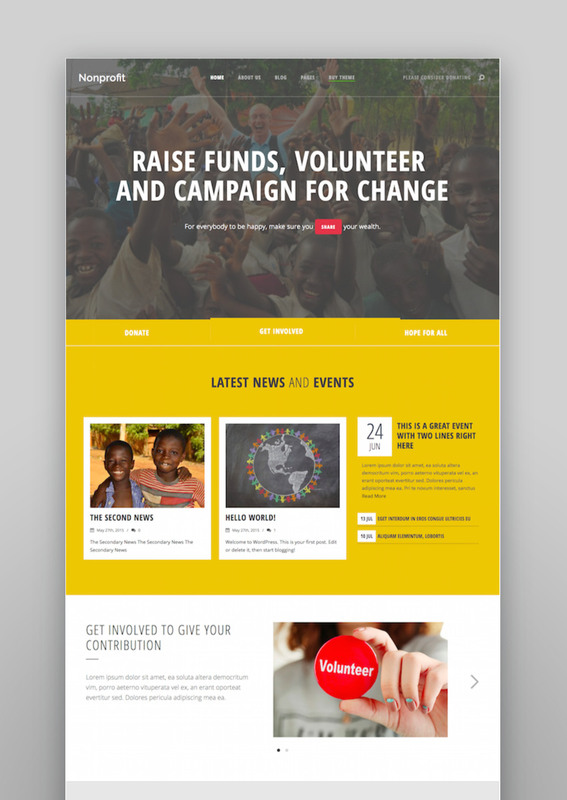 Your website is one of the most important assets you can invest in for your nonprofit. After all, you’re running a business. And trust and reputability are essential for any business–but this is most true in the nonprofit world. Unfortunately, you probably don’t have money to spend on a full-time web developer or a big website project from an external agency. Make your website in-house to save money, while still creating a website that’s user friendly, takes donations, and does everything you need. 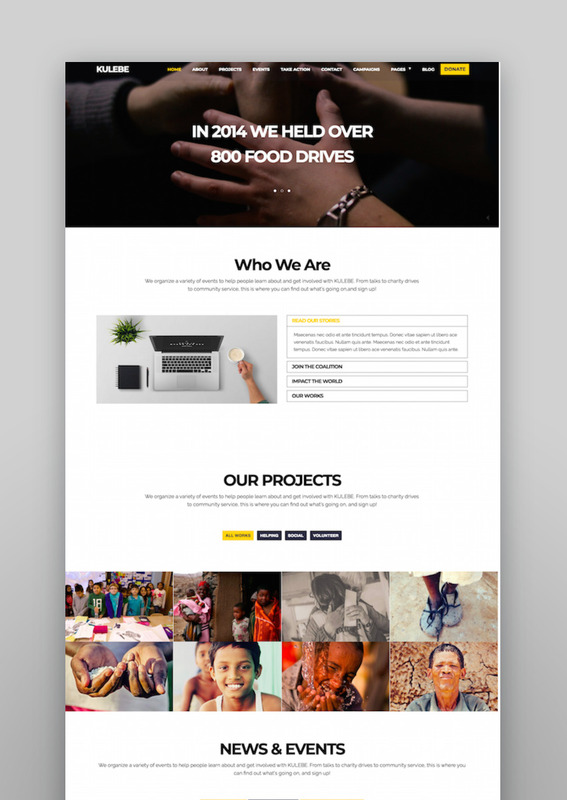 With a WordPress theme created for nonprofits, you don’t have to start from scratch. In fact, most WordPress themes have one-click installs or come with demo content, so launching your own professionally-designed website is as easy as swapping demo content for your own, and then customizing until you’ve built your perfect website. Making a website is an overwhelming endeavor. I like WordPress because it’s easy to use, but also easy to grow, unlike other website builders which can be limiting in functionality, and look a bit cookie-cutter in design. 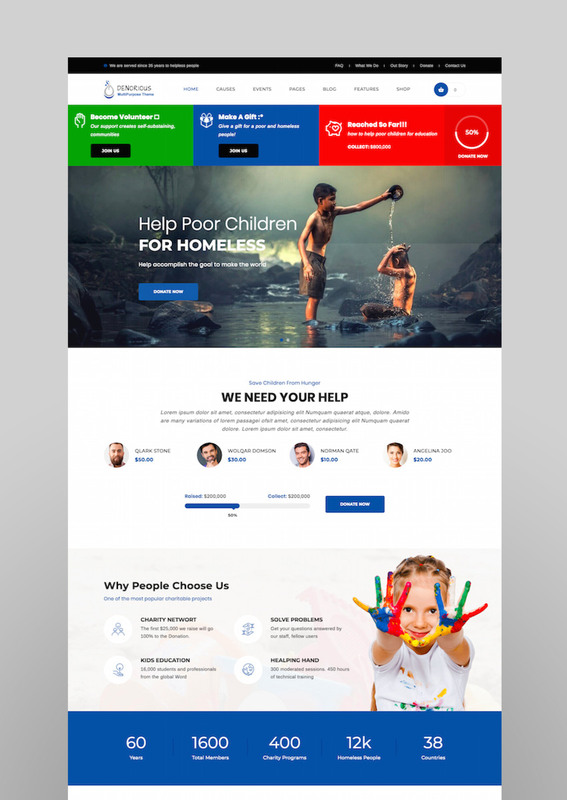 Pick one of these WordPress templates and create your website; something that can grow and adapt to the needs of your nonprofit. 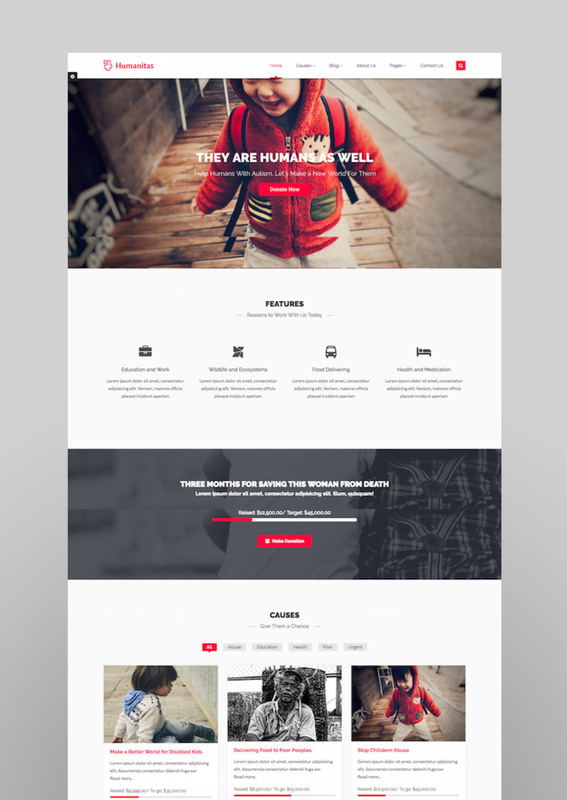 One of the best-selling WordPress theme for nonprofits, Alone is a modern theme with fresh design. Supports donations, mega menus, blog styles, events, and more. It’s fully responsive and SEO-optimized. Looking for something a little unique, with fonts that are on-trend for 2018? 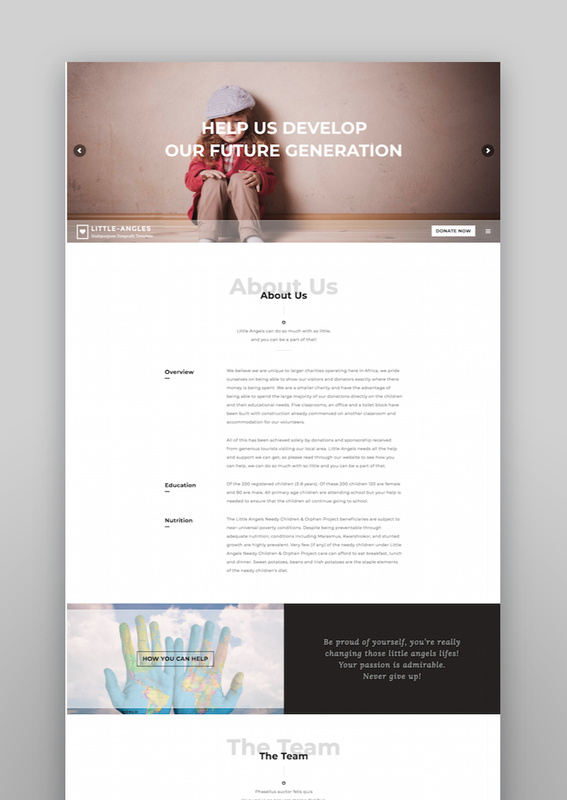 Angel is a cool theme that leads with an organized “About Us” bio, perfect for quickly explaining your mission statement and goals. It also has calls to action for donations, galleries for team members and photos, video embedding, and more. This theme works with Visual Composer, a super easy to use drag-and-drop page builder. If you haven’t used it, give it a try; you can build nearly any type of web page you can think of, and it’s no-coding-required. This WordPress theme includes unlimited icons, a revolution slider, and Font Awesome. There’s also a support team if you have questions! 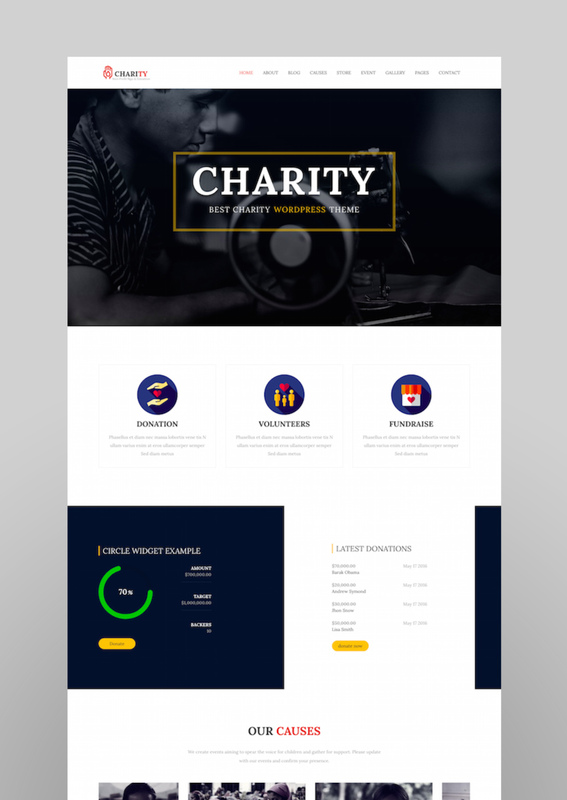 Charity theme is a top seller on our WordPress marketplace, and it’s easy to see why. Based on Visual Composer, it’s got all the bells and whistles. It works with WooCommerce, which is especially useful if you have an online store or need to be able to manage sales and donations. A nonprofit is, essentially, a business. 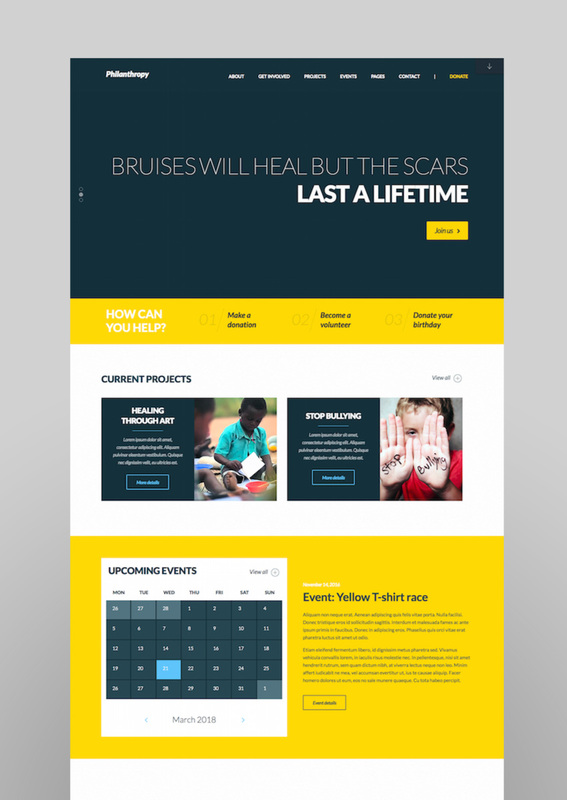 If you’re building a nonprofit or charity website, you don’t have to limit yourself to website templates built exclusively for nonprofits–instead, venture into the business-website territory. I especially like the Incubator theme, which was made with startups in mind. It’s also available to use with a website hosting service, which takes care of the site hosting and setup for you. 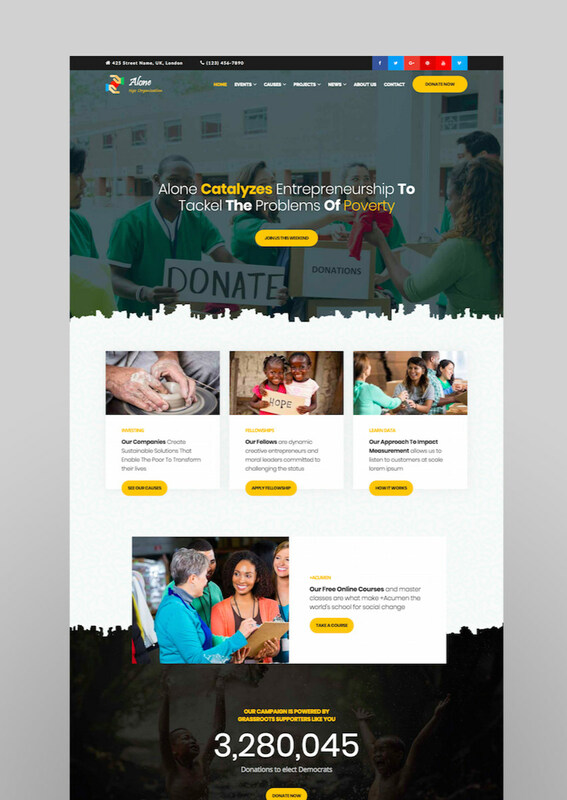 A responsive website with a bold color palette, the Philanthropy theme is a top choice for nonprofits. There’s a built-in event calendar, mega menus, and automatic backups. This theme also has advanced SEO options, which is ideal if you’re trying to create an optimized website that’s easy to find online. Created by an Envato elite theme designer, Denorious has a perfect 5-star rating so far. 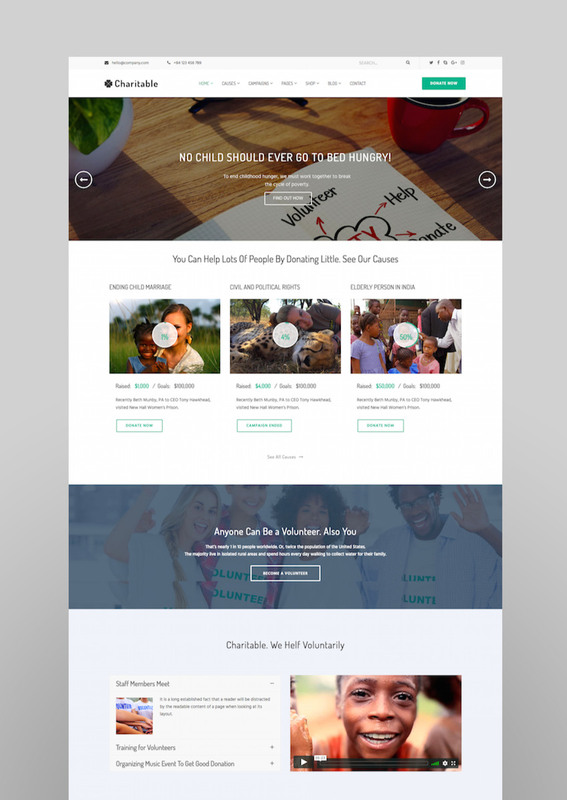 With 40+ page builder shortcodes, ten homepage layouts, and a shopfront, this theme is made for nonprofits. If you run your mailing list on Mailchimp, it’s compatible with Mailchimp and Aweber newsletter form. Launching a website for an environmental nonprofit? 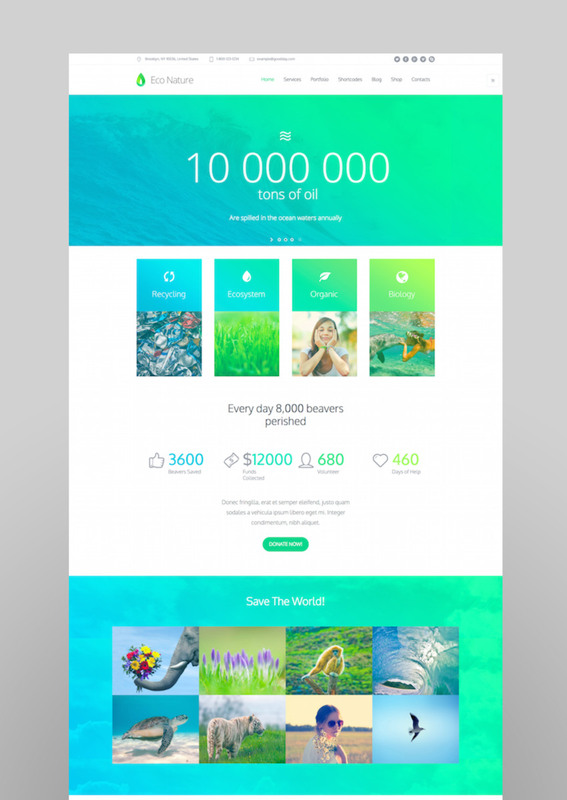 Check out Eco Nature, a theme built to help you “save the nature”. Trendy gradients and green accents make the site themed and focused on nature and conservation. 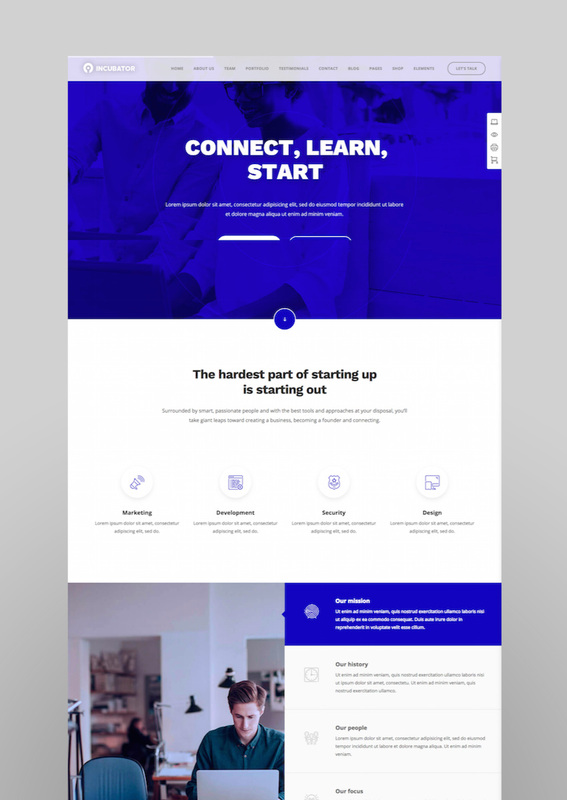 A simple website template with unlimited options. I like the “Latest News and Events” section, which gives you the option to post updates or upcoming events on the home page. 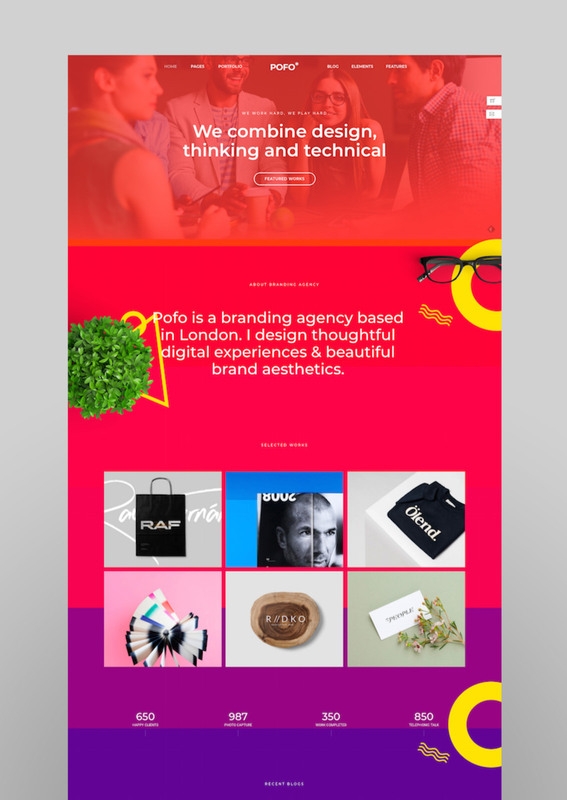 Another outside-the-box addition to this list, PoFo is a theme that was created for agencies and creative companies. At $14 (at time of writing), this theme is stylish, bright, and fun. It would be an especially good match for more creative nonprofits or projects, such as funding for the arts, documentary projects, or journalism/publications. 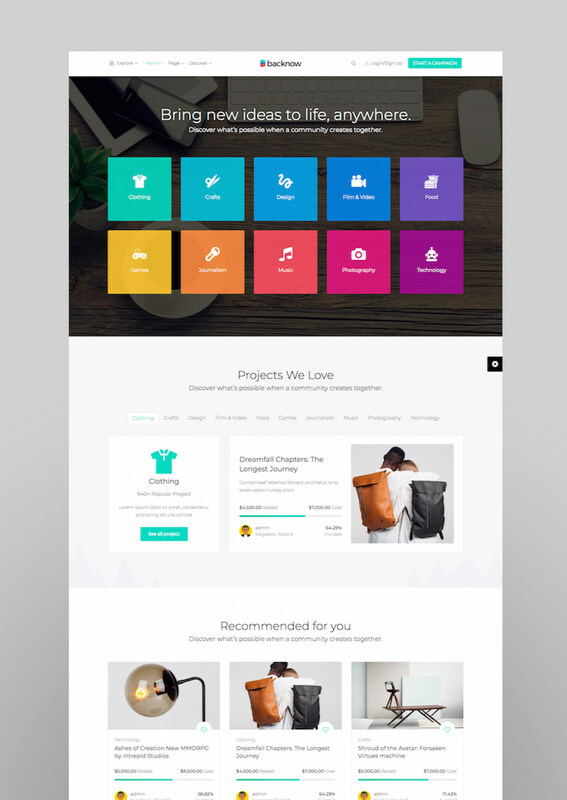 Features for this theme include Visual Composer, WPML multilingual-ready, Mailchimp subscriptions, and contact forms. It has a dedicated support team and video tutorials to walk you through the website creation process. 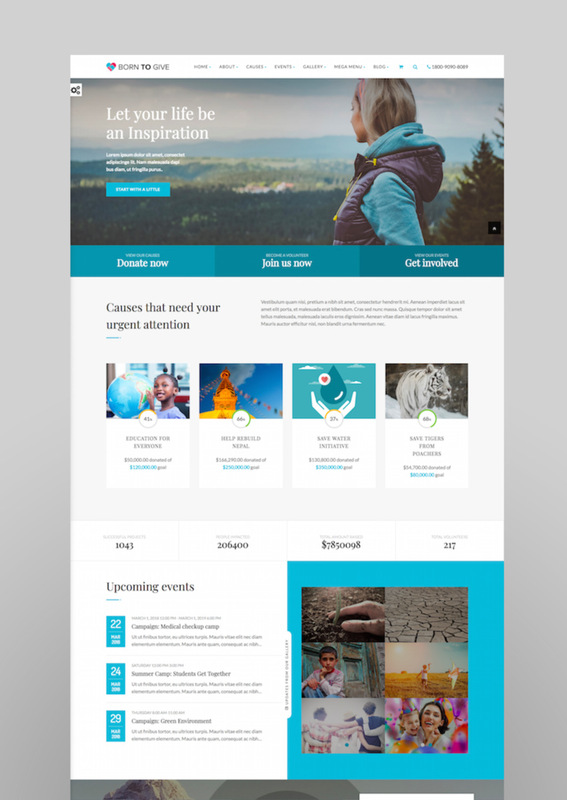 Bold and bright, this theme reminds us of companies like charity:water. It’s SEO-optimized, with lifetime updates and custom shortcodes. The yellow accents can be customized to any color scheme. If you search for “nonprofit” as a keyword on Envato Market’s website themes, you’ll find that many of the search results are focused on church sites and religious-based websites. If you’re building a website for a church, you may want to browse directly for that keyword. 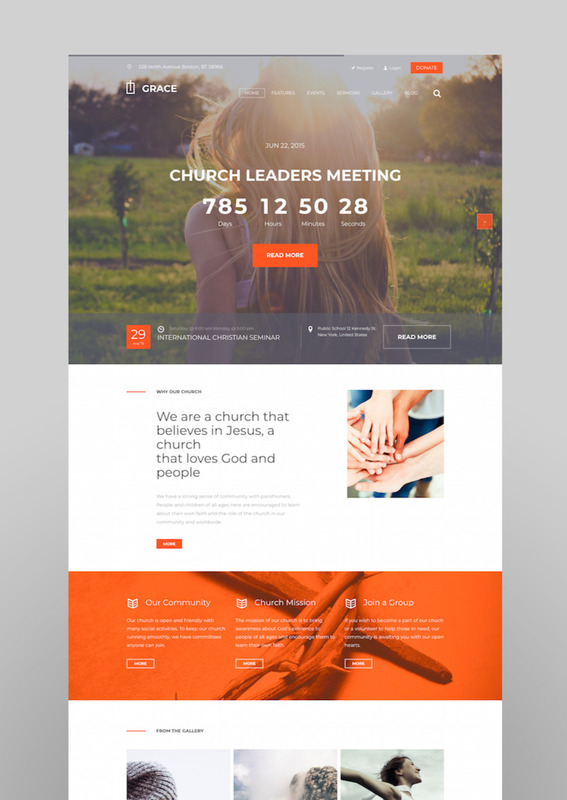 A favorite of the religion-centric nonprofit templates is Grace, a theme that’s modern and minimalistic in design. 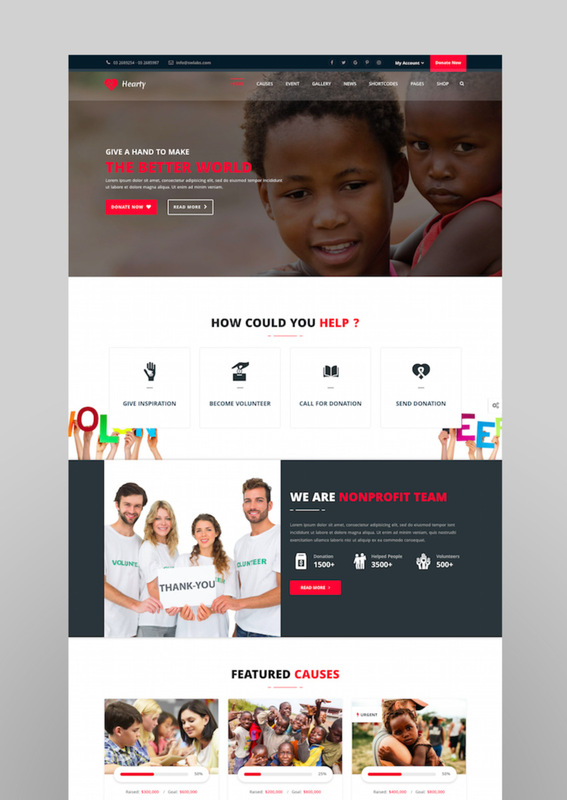 Easy to install, unlimited fundraising campaigns, and various header styles make this theme a solid choice for any nonprofit. It even has a built-in payment system that works with PayPal, Stripe, and more. This theme also has a PSD and Joomla version, so if you’re coding-savvy or want to play around with it, it’s a good option. Want a website in less than three minutes? That’s how long it takes to install this one, which comes with demo content included–just swap it with your own and you’re good to go. There are also custom pages and post types, with donation buttons, Facebook buttons, events, and contact forms. Crowdfunding is a fundraising strategy that focuses on raising funding online through social networks, friends, and family. BackNow is built for crowdfunding campaigns, so your website is guaranteed to be shareable and simple to donate to. Based on Twitter Bootstrap 3x framework, this website looks great on tablets, smartphones, and computers. It includes an events calendar, various page designs, Visual Composer, and WooCommerce shops. It’s integrated with Google Fonts, so it’s super customizable (though we like the serif-based font styles in the site demo). We’re ending this list strong with Hearty WordPress, a popular theme from elite theme designer TheRubikThemes. 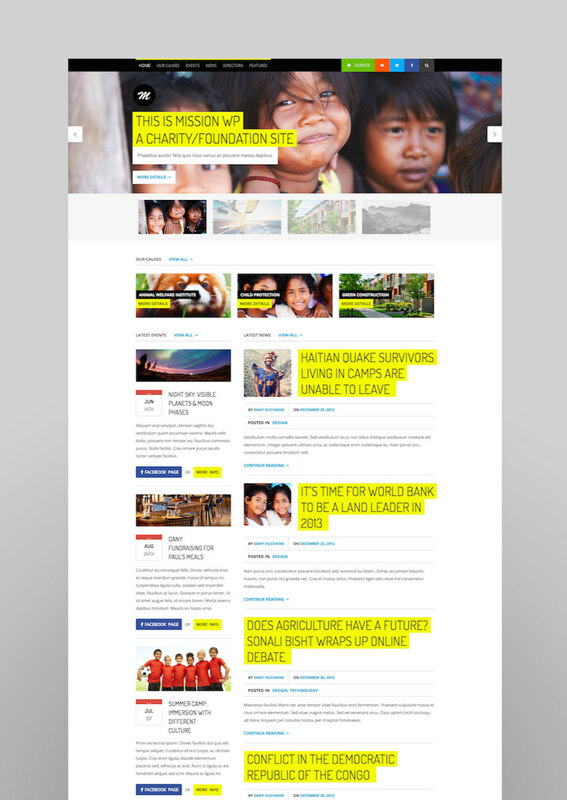 It’s built based on research of the most effective design for nonprofit websites. Responsive design, blog layouts, 6 homepage options, 100+ shortcodes –it has all the things.